I was the fringe of the Nirvana craze. I was four when he died. 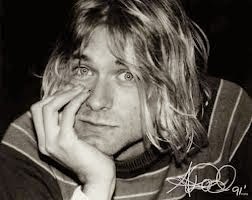 The Kurt I knew was in photographs, songs in the radio that I slowly pieced together as belonging to the same voice, and a general aura of legend that shrouded his voice in whispers. I knew him in the feedback and off-key chords of "Aneurysm." The repressed self-hatred in "Lithium." And, of course, the tortured growls of "Smells Like Teen Spirit." I can't claim Kurt like the 80s kids who moshed at his concerts and slammed to their knees after that most dreaded press release. But I can claim what he gave me. Hours of peace to stave off the tumult. Lines of comfort and devastating sad empathy. An ear for troubled prayers. Kurt and Nirvana were and are the anthem for internal chaos. For pain and confusion. For disillusionment and a subsiding ache. Nirvana buoyed me through moments of deep depression and crippling self-doubt. There will never be enough words to show gratitude for that debt. I can only wish that, in the end, Kurt had found for himself what he has been to me.